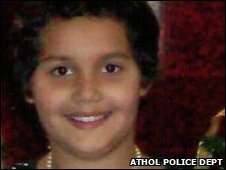 A nine-year-old girl, allegedly kidnapped by her grandmother, has been found using a mobile phone signal and Google Street View. A police officer and a firefighter in Athol, Massachusetts, joined forces after authorities were alerted that Natalie Maltais had been taken. Officers used GPS in the girl's mobile phone to find her approximate location. They fed the co-ordinates into Google Street View, pinpointing a hotel where the child was subsequently found. The alarm was raised after grandmother Rose Maltais picked up Natalie from the child's legal guardians for what was supposed to be a weekend away. 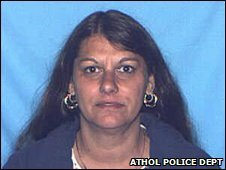 She "said that she wasn't going to return Natalie and then left the state", Athol police chief Timothy Anderson told the BBC. The police contacted Ms Maltais, but after she didn't return Natalie as promised, they decided to track them down using Natalie's mobile phone. Since 2005, US law says that mobile phone providers must be able to locate 67% of callers within 100 metres and 95% of callers within 300 meters. This requirement has led to GPS capability in most new mobile phones in the US. "This is very useful, although we can only use it in emergency situations such as when a person is missing or lost, or a life is in danger," said chief Anderson. Knowing this, police officer Todd Neale contacted the mobile phone provider, AT&T, which gave him GPS coordinates every time the phone was activated. Police must submit a compliance form to the phone provider to request location information. Officer Neale then got in touch with Athol's deputy fire chief Thomas Lozier who had previously used GPS to direct firefighters tackling forest and brush fires, and to find lost hikers. "Last spring, there was an incident where the cell phone transmitted the co-ordinates of some people lost in a local conservation area," deputy chief Lozier explained. "We tracked them down using hand-held GPS units and within an hour we'd gotten them back." He used mapping software to determine the location of the co-ordinates given to him by Officer Neale over the radio. Then he turned to Google. "As soon as the officer said to me, 'I wonder how we can research the area', I thought of it," he said. He found the location on Google maps and looked at the Street View, which shows eye-level photographs of the area. That's when he spotted a nearby hotel. "I noticed the hotel in the area, and as I was panning the map, I was able to see the road sign at the intersection," he said. 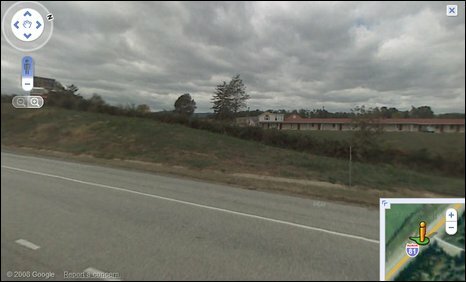 He used Google to search for hotels near that intersection and found the Budget Inn in Natural Bridge, Virginia. Officer Neale alerted the Virginia state police, who found the missing child and her grandmother in the hotel as predicted. The deputy fire chief said how happy he was with the outcome of his team effort with Officer Neale. "It was brilliant," he said. "Half an hour later, he called me [on my walkie-talkie] at home. I had my home computer ready to go and he informed me that it had been successful."